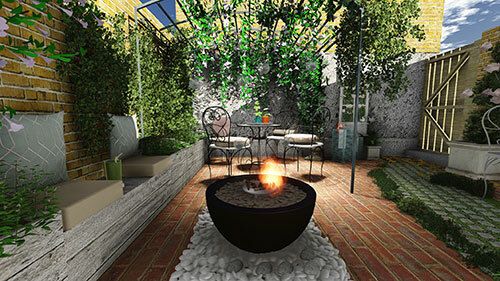 One of our most recent courtyard designs was for a client who wanted to create a uniquely individual garden space at their Victorian home. The brief was "nothing modern, Victorian and traditional in style and maximise the sunniest part of the garden"
The Investment for this garden is an expected Fifteen Thousand Pounds, and a design cost of £750.00. This included a 2D overview and several 3D generated images that allows the client to become immersed within the design. The brief was to restore a beautiful Town House garden nestled below the Surrey Hills in Oxted. The garden was designed ten years ago and was now in need of some updating, including new planting, structure and restorations. The theme was contemporary with influences of cottage style planting to create a haven for our clients with fragrances of Jasmin, rosemary, and roses, together with vibrant colours throughout the year. The front garden contained a large tree and uneven paving laid by the developer ten years ago leading to the front door. This is where visitors take in first impressions of the home and garden, therefore it was important to rejuvenate this area and deliver an entirely new warm and welcoming atmosphere. Mission accomplished! The design brief was to create a garden on a contemporary theme with influences of Provenance planting using Lavenders, Olives and Agapanthus. In addition, traditional planting, such as Roses and Buxus. This traditional garden in rural East Sussex benefits from wonderful views across the countryside with a south facing aspect. The garden is split into two areas with a courtyard garden directly outside the kitchen area that is designed with a hit of influences from France, which together with inspired water storage and stone seating with ladder herb garden and a bespoke wired pergola to give shade on hot sunny days. The rear garden is divided further with soft sweeping planting, including wild flowers and specimen trees such as Betula Jacquemontii multi stem to give structure. We then move round to a more intimate terrace where the alcove of the property has been used to form a softer terrace accessed directly through garden doors. This city garden in the heart of Wimbledon was created to form an intimate garden with influences from the south of France using lavender, olives, agapanthus, rosemary, wisteria and other fragrant planting. The design is formed on symmetry with interlocking curves of raised planting, smaller intimate terrace and artificial grass that reduces maintenance and allows our clients to spend more time relaxing than working in the garden. Lighting is used to bring the garden to life at night with festoon lights and up lighters on specimen plants. We have an ongoing Maintenance contract with a beautiful Manor House in Surrey. Our project started by completely renovating a barren Rose Garden, we started the project by reconditioning the soil and general ground work around the property. This was then followed by planting many species of roses alongside an abundance of colourful and fragrant planting. We replanted the original beds and gave vibrancy back to a beautiful traditional English garden. In the heart of Surrey, a beautiful, well established garden was lacking inspiration and purpose. Our Clients lead busy lives so we started the process of helping them feel at one with nature. Firstly, designing a multinational Summer House which is an office area and relaxation zone. We have set the Summer House on a rotating platform within a private terrace area that would seat 2/4 people comfortably. Within our CGI designs we created a wild meadow that sits within an orchard of a variety of fruiting trees. A tranquil area to relax and watch the sun go down whilst laying in a hammock. In a continuing project which includes design, renovations,planting and construction we have developed areas within a family garden. We have created new formal hedges, pathways and planting. 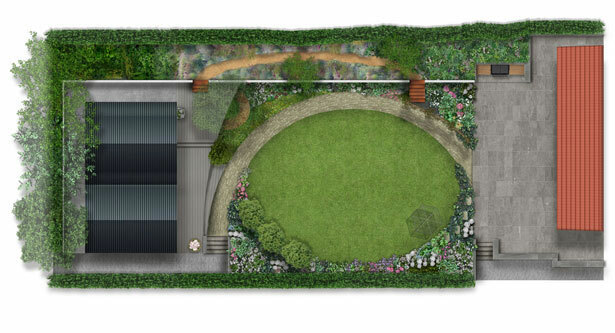 This project is a continuation of the design below, 'Spring & Summer Meadow Garden Design'. 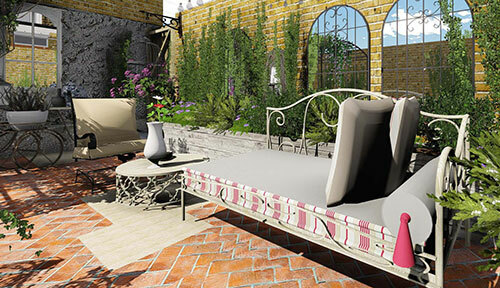 Producing augmented reality, or CGI concepts, allows the opportunity to see a real time photograph of how the garden and space will look after the designs are realised. We were appointed to tackle a well established garden, full of plants and trees with a recently installed swimming pool and tennis court. The garden is extensive with formal areas around the house and informal and naturalised areas towards the boundary. The first phase is to focus on the informal areas, we looked at two areas of bulb planting. The first under a large rhododendron border for early spring flowers and the second area for mid spring and summer flowers. Early in 2017 we were appointed by Brogdale National Fruit Collection in Faversham, Kent to create a wildlife and educational garden. This would help engage both young and older minds with how gardens can maintain and increase wildlife that is in decline in many of our towns, cities and villages. Demonstrating how nature can work with gardens in preventing pests and diseases, and an ecological approach to gardens by feeding birds, hedgehogs and of course us with a working and interactive 'Edible Garden. We were appointed by a client at a property on the edge of the Surrey Hills; seeking a contemporary garden with a traditional edge. The garden is long and sloping, therefore the area would need to be carefully designed. We included a variety of terraces to allow areas of level ground to maximise the space available. Our main concept was to design a garden that could gradually fade from the contemporary aspect immediately at the rear of the house to a more traditional garden at the far end using wild flowers, fruit trees and a vantage point to look back and take in the garden from a softer view. In the heart of Kent we found an incredibly old walled garden belonging to a Manor House. This garden, historically a traditional styled walled garden, although not a great deal was known about the original planting we recreated it's beauty after the previous owners had installed a swimming pool. Our clients were inspired to return it to its original use, appointing Wonderful Gardens to create a garden full of colour, fragrance and structure. Our design brought joy, inspiration, peace and refuge to our clients with a garden used for cutting flowers from spring until late autumn.